Ask any realtor. If you want a surge in business, plan a trip out of town. I’m currently experiencing that surge, as I prepare to leave. Monday was very busy with a quick visit to AR to see Greg’s dad this morning and clients and taking care of business the rest of the day. I had not worked a first into the day yet, when my sister Linda invited me to dinner. She picked me up and we headed to one of our favorite restaurants for a sisters’ evening out, Red Lobster. Linda and I have had many sisters’ outings. And we’ve eaten at Red Lobster many times. However, I seized the opportunity to experience a first by perusing the menu for an entrée I had never had before. This wasn’t difficult. I have been a creature of habit for far too long. I always get the broiled seafood platter, which probably has a fancier name on the menu. I like it. And, I know I’m going to like it, every time. In the spirit of new adventures, I didn’t even open the regular menu, but latched onto the specials menu. 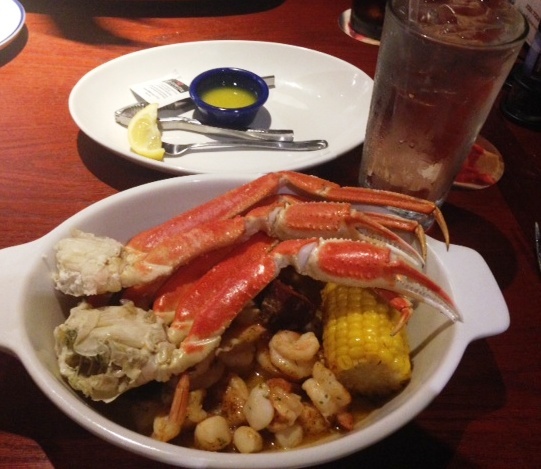 Because, it is Crabfest 2014 at Red Lobster! As I looked over the succulent crab dishes, I knew I had found my first. I like crab…crab legs, crabmeat patties, crab salad. And the menu had those great words next to several entrées: “New menu item”. Perfect. I’d try a new dish, off of the Crabfest menu. I selected the Crab Bake Dinner featuring crab legs, baked shrimp and scallops, corn on the cob and roasted new potatoes. We had a great dinner. Our waiter, Mark, was attentive, humorous and not fazed at all by two fun-loving ladies out for a sisters’ night. When we teased him, he teased back. The food was delicious, from the hot cheddar biscuits and side salads to the scrumptious main dishes. I enjoyed my first and appreciated that it was baked rather than fried. Of course, the best part of the meal was laughing and talking with my sister. Yesterday, I realized later, was Sisters Day. I didn’t get to see my sister, Debbie, to celebrate. But Linda and I enjoyed a mini celebration, in a corner booth in Red Lobster. We didn’t need balloons or noise makers or even dessert. We just had to get together for a good time to happen. 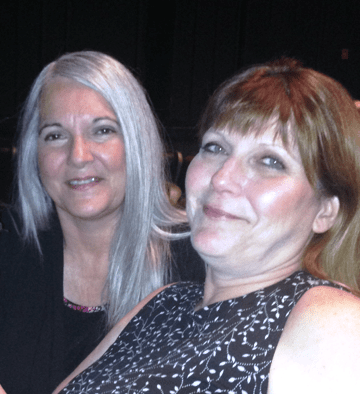 When my other sister Debbie joins us, those good times grow exponentially. Sisters truly are life time best friends, and I appreciate both of my sisters and their unique gifts that they offer to me and to the world. Red Lobster, Crab Bake Dinner and chuckles and chats with my sister. My work day isn’t quite over, as I have computer and paperwork to do, but what a great break in the day, to refresh and recharge.